Anyone who plays basketball knows that ball handling is an extremely important aspect of the game. Unfortunately, it also has proven to be the most difficult part of the game to master. That is why we compiled a list of the 50 best dribbling drills designed to improve your ball handling. To see which balls we recommend to use for the drills, check out our best outdoor basketball and best indoor basketball review. Without dribbling, continually move the basketball in a circle around your body by transferring the ball from one hand to another in front of your body and then behind your body at waist height. Perform this for 30 seconds, then switch directions. Perform the same around the back movement as the previous drill, only this time do it at knee level. Perform for 30 seconds, then switch directions. Put one leg about 1.5x shoulder width in front of the other. Then move the basketball around the front leg only for 15 seconds each direction. Then switch legs. Bend your knees, and with feet approximately 1.5x shoulder width apart, crossover the basketball in front of you low and wide. Make to to not let the ball ever go above your waist. Do 30 total crossovers. Put one leg about 1.5x shoulder width in front of the other and bend your knees. Dribble the ball between your legs without letting the ball go above your waist. Perform 30 between the legs, and then switch legs. Stand with your feet about 1.5x shoulder width apart and bend your knees. Dribble the ball behind your back low and wide, crossing it over from hand to hand. Make sure that the ball does not go above your waist. Perform 30 behind the back crossovers. Stand with one foot in front of the other about 1.5x shoulder width. With only one hand, dribble low and fast dribbles around your lead leg, never letting the ball go above your knee. Do 10 circles each direction, then switch lead legs. Stand with your feet about 1.5x shoulder width apart and bend your knees. Using low and rapid dribbles, dribble the ball in a figure eight motion around your legs. Do 10 complete figure eights and then switch directions. Dribble the ball with your right hand only from side to side in front of you. Keep the ball below your waist at all times. Perform 20 crossovers, then switch to your left hand. With your right hand only, dribble the ball on your right side, then perform an in and out to keep the ball on your right side. Keep the ball below your waist at all times. Perform 20 in and outs, then switch to your left hand. Dribble the ball back and forth (front to back) on your right side and using only your right hand. Keep the ball below your waist and perform 20 v-dribbles, then switch hands. Stand with your feet about 1.5x shoulder width apart and bend your knees. Dribble the ball once on your right side, then wrap the ball around your back to your left hand. Then dribble once on your left side then wrap the ball around your back to your right hand. Be sure to keep the ball below your waist at all times. The around the back dribble should be a wrap around dribble, not a behind the back crossover. Perform 30 total wrap arounds. Standing with feet about 1.5x shoulder width apart and knees bent, dribble the ball as hard as you can (while still keeping control) at knee height. Perform 30 dribbles with your right hand, then switch to your left hand. Standing with feet about 1.5x shoulder width apart and knees bent, dribble the ball as hard as you can (while still keeping control) at waist height. Perform 30 dribbles with your right hand, then switch to your left hand. Standing with feet about 1.5x shoulder width apart and knees bent, dribble the ball as hard as you can (while still keeping control) at shoulder height. Be sure to keep your hand on top of the ball at all times (ie do not carry the ball). Perform 30 dribbles with your right hand, then switch to your left hand. Standing with feet about 1.5x shoulder width apart and knees bent, dribble the ball 3 times on your right side and then crossover to your left hand, where you will do the same thing. Be sure to dribble the ball hard and low, keeping the ball below your waist at all times. Perform 30 total crossovers. 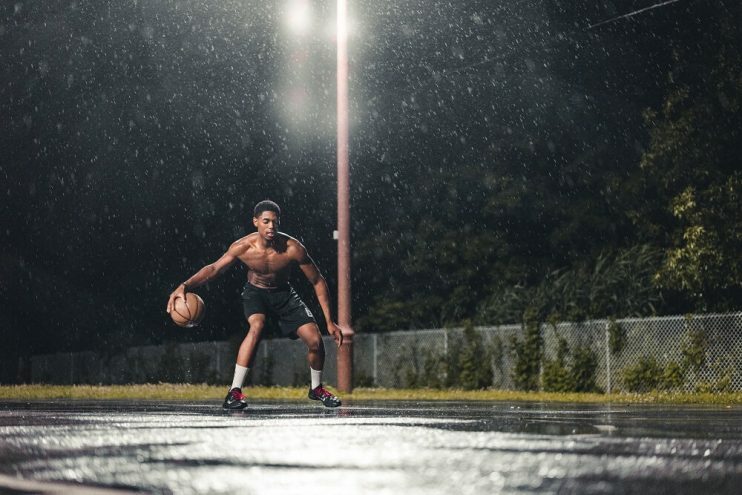 Standing with one foot in front of the other about 1.5x shoulder width apart and knees bent, dribble the ball 3 times on your right side and then crossover between your legs to your left hand, where you will do the same thing. Be sure to dribble the ball hard and low, keeping the ball below your waist at all times. Perform 15 total crossovers, then switch lead legs. Standing with feet about 1.5x shoulder width apart and knees bent, dribble the ball 3 times on your right side and then crossover behind your back to your left hand, where you will do the same thing. Be sure to dribble the ball hard and low, keeping the ball below your waist at all times. Perform 30 total behind the back crossovers. Standing with feet 1.5x shoulder width apart and knees bent, dribble each ball on the side of your body hard and low at knee level. Perform for 30 seconds. Standing with feet 1.5x shoulder width apart and knees bent, dribble each ball on the side of your body hard at waist level. Perform for 30 seconds. Standing with feet 1.5x shoulder width apart and knees bent, dribble each ball on the side of your body hard at shoulder level. Be sure to keep your hand on top of the ball at all times. Perform for 30 seconds. Standing with feet 1.5x shoulder width apart and knees bent, dribble the balls in front of you side to side, keeping the same ball in the same hand. The balls should always be bouncing in sync and going the same direction, like windshield wipers. Be sure to keep the ball below your waist at all times. Perform this for 30 seconds. Standing with feet 1.5x shoulder width apart and knees bent, dribble the balls at your sides moving them from front to back, keeping the same ball in the same hand. The balls should always be bouncing in sync and going the same direction. Be sure to keep the ball below your waist at all times. Perform this for 30 seconds. Standing with feet 1.5x shoulder width apart and knees bent, dribble the balls at your sides, one hand dribbling knee height while the other dribbling at least waist height. Perform for 30 seconds then switch. Standing with feet 1.5x shoulder width apart and knees bent, crossover one ball in front of you and one ball behind you continuously. Do this for 30 seconds and then switch directions. Standing with feet 1.5x shoulder width apart and knees bent, dribble one ball hard and at knee height, while you use the other hand to dribble the other ball in circles around that leg. Do this for 30 seconds, then switch directions of the circles. Then switch which hand is dribbling in circles. Standing with feet 1.5x shoulder width apart and knees bent, dribble each ball at waist height 3 times, then with one ball crossover low in front of you while transferring the other ball to your hand that crossed over. Perform 15 crossovers, then switch which hand is crossing over. Standing with feet 1.5x shoulder width apart, one leg in front of the other, dribble each ball at waist height 3 times. Then with one ball crossover between your legs (left to right crossover if your right leg is the lead leg and vise versa for left leg as lead leg) while transferring the other ball to the hand that just performed the crossover. Perform 15 crossovers, then switch lead legs. Standing with feet 1.5x shoulder width apart and knees bent, dribble each ball low at knee height in a circle around each of your legs. Do 15 circles, then switch directions. Dribble 3 times while running at an angled direction and then perform a hard and low crossover to completely switch the direction you’re running. Do this the full length of a court and then back. Dribble 3 times while running at an angled direction and then perform a hard and low crossover between the legs to completely switch the direction you’re running. Do this the full length of a court and then back. Dribble 3 times while running at an angled direction and then perform a hard and low crossover behind the back to completely switch the direction you’re running. This crossover behind the back should not be a wrap around. Do this the full length of a court and then back. Dribble 3 times while running at an angled direction and then perform an around the back wrap around to completely switch the direction you’re running. Do this the full length of a court and then back. Dribble 3 times while running straight and then perform a single hand in and out along with a hesitation before. Do this the full length of a court and then back. Dribble 3 times while running at an angled direction and then perform a spin move to completely switch the direction you’re running. Do this the full length of a court and then back. Dribble 3 times while running at an angled direction and then hesitate, do an in and out, and then a crossover hard and low to completely switch the direction you’re running. Do this the full length of a court and then back. Dribble 3 times while running at an angled direction and then perform a hard and low crossover to completely switch the direction you’re running, followed by an in and out. Do this the full length of a court and then back. Dribble 3 times while running at an angled direction and then hesitate, do an in and out, and then an around the back wrap around to completely switch the direction you’re running. Do this the full length of a court and then back. Dribble 3 times while running at an angled direction, then perform a crossover followed by a between the legs crossover, followed immediately by a spin to completely switch the direction you’re running. Do this the full length of a court and then back. Dribble 3 times while running at an angled direction and then hesitate, then do an in and out, followed immediately by a spin to completely switch the direction you’re running. Do this the full length of a court and then back. Set up cones staggered in a zig zag direction up and down the court, separated by about 10 feet. Dribble to each cone as fast as you can, then perform 3 quick crossovers at the cone, then run to the next cone and do the same thing. Do this the full length of a court and then back. Set up cones staggered in a zig zag direction up and down the court, separated by about 10 feet. Dribble to each cone as fast as you can, then perform 3 quick between the legs crossovers at the cone, then run to the next cone and do the same thing. Do this the full length of a court and then back. Set up cones staggered in a zig zag direction up and down the court, separated by about 10 feet. Dribble to each cone as fast as you can, then perform 3 quick behind the back crossovers at the cone, then run to the next cone and do the same thing. Do this the full length of a court and then back. Jog the full length of a court and back, dribbling both balls low and hard at knee height. Jog the full length of a court and back, dribbling both balls low and hard at waist height. Dribble 3 times while jogging forward, and then 2 dribbles backward. Do this the full length of a court and back. Dribble 3 times while jogging forward, then crossover one ball in front of you and one ball behind you. Do this the full length of a court. On the way back, switch the direction of your crossovers. Dribble 3 times while jogging forward, then crossover one ball between your legs and one ball behind you. Do this the full length of a court. On the way back, switch the direction of your crossovers. Jog the full length of a court and back, dribbling the two balls in front of you with v dribbles. Walk the full length of a court and back, dribbling the two balls at your sides with forward to back v dribbles. These 50 best dribbling drills are designed to take any skill level player to the next level in terms of ball handling. Whether you are a beginner, amateur, or college level player, these drills can help you improve your dribbling in real game situations.